Locomotives on the Great Central Railway There are many steam and diesel locomotives based at the Great Central Railway. Some are being restored, some being repaired and maintained and some are in service. Because of the nature of these veteran forms of railway motive power the running situation changes frequently. 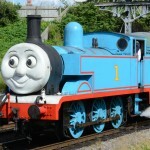 And, of course, we have visiting locomotives to add to the variety. Please see these pages for the latest situation on any particular locomotive. Detailed reports on the condition of locomotives are given in Main Line, the quarterly magazine for members of Friends of the Great Central Main Line. No.6990 “Witherslack Hall” Great Western Railway Modified Hall Class 4-6-0 Built at Swindon in 1948. Withdrawn in 1965. Arrived at the GCR in 1975. Witherslack hall is now in regular GCR service after returning from overhaul in 2015. Operational. No.92214 British Railways Standard Class 9F 2-10-0 Built at Swindon in October, 1959. Withdrawn August 1965. Arrived at GCR on 10th January, 2014. Operational. No.48624 London Midland and Scottish 8F Class 2-8-0 Built at Ashford in 1943. Withdrawn in 1965. 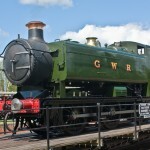 Arrived at the GCR in 2011. Operational. No.46521 London Midland and Scottish Railway Class 2 2-6-0 Built at Swindon in 1953. Withdrawn 1966. Arrived at the GCR in 2001. Returned to steam in 2011. Operational. No.78018 British Railways Standard Class 2 Built at Darlington in 1953. Withdrawn in 1966. Arrived at the GCR on 8th November, 2012 for completion of restoration and entered service in October 2016. Operational. No.73156 British Railways Standard Class Five 4-6-0 Built at Doncaster in 1956. Withdrawn 1967. Arrived at the GCR in 2001. Returned to service in 2017 for the first time in 50 years having been restored from scrap yard condition. Operational. No.48305 London Midland and Scottish Railway 8F Class 2-8-0 Built at Crewe in 1943. Withdrawn 1968. First arrived at GCR in 1985. Returned to traffic in 1995. Left GCR in 2000 and returned in 2006. Expected to return to traffic in early 2019. No.70013 "Oliver Cromwell" British Railways Class 7P 4-6-2 Built at Crewe in 1951. Withdrawn 1968. Arrived at GCR in 2004. Returned to traffic in 2008. Appears courtesy of the National Railway Museum. Withdrawn on 1st January 2019 for overhaul. No.63601 Great Central Railway 8K Class 2-8-0 Built at the Gorton, Manchester, works of the Great Central Railway in 1912. Withdrawn 1963. Arrived at the GCR in 1996. Returned to steam in 2000. Withdrawn on 24th June, 2012 for a major overhaul. No.777 “Sir Lamiel” Southern Railway King Arthur Class 4-6-0 Built at North British Locomotives Works, Glasgow in 1925. Withdrawn 1961. Arrived at the GCR in 1995. Returned to steam in 2006. Operates on Network Rail and GCR. Withdrawn for overhaul. No.34039 “Boscastle" Southern Railway Rebuilt West Country Class 4-6-2 Built at Brighton on 1946. Withdrawn 1965. Arrived at the GCR in 1973. Returned to traffic in 1993. Withdrawn for further overhaul in 2000. Undergoing a major overhaul. No.45491 London Midland and Scottish Railway Class Five (Black Five) 4-6-0 Built at the LMS Derby Works in December, 1943. Withdrawn in 1965. Arrived at the GCR in 2011. Currently undergoing restoration. No.78019 British Railways Standard Class 2 2-6-0 Built at Darlington in 1954. Withdrawn 1966. Arrived at the GCR in 1998. Returned to steam in 2004. Under overhaul. 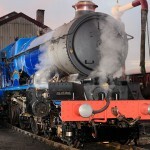 No.567 GCR Class 2 4-4-0 New Build Project. 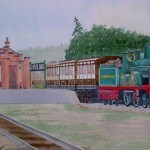 To be built at GCR(N). Class 08 D3690 Built in 1959, spending much of its life in the Eastern Region of BR, before moving to Toton in EWS ownership. Arrived at the GCR in July 2014. Operational. Class 08 08694 Built at Horwich in 1959. Withdrawn in 2004. Arrived at the GCR in 2009. Entered GCR service on 8th September, 2013. Operational. Class 10 D4067 (10119) Operational. Class 20 D8098 Built by English Electric/RobertStephenson & Hawthorns Ltd, Darlington in 1961. Withdrawn in 1982. Arrived at the GCR in 1992. Currently withdrawn for repairs. Class 25 D5185 “Castell Dinas Bran” Built at Darlington in 1963. Withdrawn in 1987. Arrived at the GCR in 2002. Returned to traffic in 2006, and again in 2015 after an overhaul. Operational. Class 27 D5401 Built by the Birmingham Railway Carriage & Wagon Company in 1962. Withdrawn in 1987. First ran on the GCR in 1994. Returned in 2009. Currently withdrawn for repairs. Class 31 D5830 Built by Brush at Loughborough in 1962. Withdrawn in 1996. Arrived at the GCR in 1998. Returned to traffic in 1999. Operational. Class 33 D6535 Built by the Birmingham Railway Carriage & Wagon Company in 1960. Withdrawn in 1998. Arrived at the GCR in 2005. Operational. Class 37 37714 Built by English Electric in 1961. Converted to 37/7 in 1998. Repainted to BR Railfreight Grey (Metals Sector) livery. Currently away from the railway for maintenance. Class 45 D123 “Leicestershire and Derbyshire Yeomanry” Built at Crewe in 1961. Withdrawn 1987. Arrived at the GCR in 1998. Operational. Class 47 1705 “Sparrowhawk” Built by Brush at Loughborough in 1965. Withdrawn in 1991. Arrived at the GCR in 1996. Operational. Class 50 50017 “Royal Oak” Built by English Electric in 1968. Withdrawn in 1991. Arrived at the GCR in in February 2019. Awaiting entry to service. Class 101 Built by Metropolitan Cammell in Birmingham in the 1950s. Arrived at the GCR in 2003. Now in regular operation as a three-car unit. Operational..
Class 127 Built at Derby in 1959. Arrived at the GCR in the 1980s. Returned to service in 2013 after a period of inactivity. Withdrawn from service. No.1744 Great Northern Railway N2 Class 0-6-2T Built at the North British Locomotive Works, Glasgow in 1920. Withdrawn 1962. Arrived at the GCR in 1975. First returned to traffic in 1978. Withdrawn in 1994. Returned to traffic for second time in 2009. 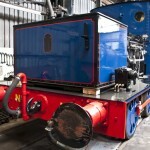 The locomotive is now based elsewhere but it is hoped that the N2 will return to the GCR from time to time in the future. No.76084 British Railways Standard Class 4MT 2-6-0 Built at Horwich in March, 1957. Withdrawn in December, 1967. Returned to traffic in July, 2013. 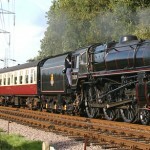 Visiting the GCR from September for the Autumn Steam Gala. 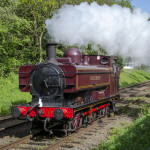 RSH Austerity No.22 Built by Hunslet of Leeds in 1956. Withdrawn in the mid 1970s. Visited the GCR in 2012. No.9466 Great Western Railway 94XX Class 0-6-0 Pannier Tank Built by Robert Stephenson and Hawthorn in 1952. Withdrawn in 1964. Returned to steam in 1985. Visited in 2012 to take part in the Autumn Steam Gala. No.1 "Thomas" Hunslet Austerity 0-6-0T Built by Hunslet in Leeds in 1952 as a saddle tank. 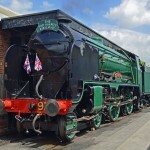 Visited the GCR in 2012. 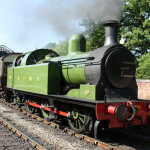 No.1 left the GCR on 30th September, 2012. No.925 "Cheltenham" Southern Railway Schools Class 4-4-0 Built at Eastleigh in 1934. Withdrawn in 1962. 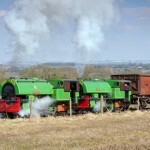 Returned to steam at the Mid Hants Railway in 2012. Visited GCR for the 2012 Autumn Steam Gala. 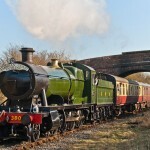 No.3803 Great Western Railway 2884 Class 2-8-0. Built at Swindon in 1938. Withdrawn in 1963. Restored to steam at Buckfastleigh in 2005. Arrived at the GCR in 2013 for the Winter Gala. No.3803 left in March, 2013. 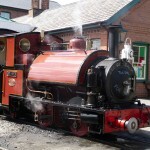 No.3 "Sir Haydn" Built in 1878 by Hughes' Locomotive & Tramway Engineering Works Ltd of Loughborough. Visiting the GCR as a static exhibit in April, 2013 for the Swithland Steam Gala. "Judy" and "Alfred" Built by Baganall sin 1937 and 1953 respectively for use at the Par Harbour. The arrived on the GCR on 23rd April, 2013 for the Swithland Steam Gala in April, 2013. Left the GCR on 15th May, 2013. 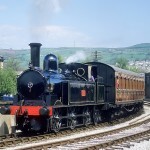 No.1054 LNWR Coal Tank. Built at Crewe in 1888. Withdrawn in 1958. 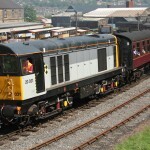 Restored at the Keighley and Worth Valley Railway in 1980 and again in 2011. 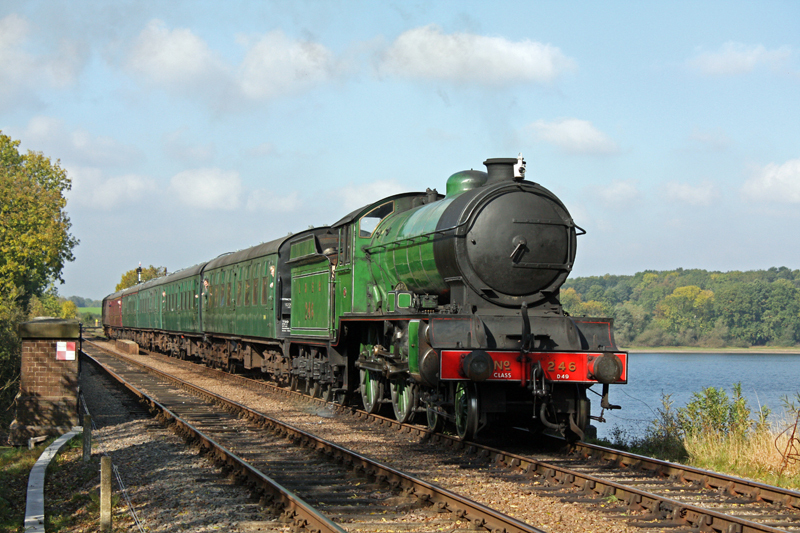 Visited GCR for the 2013 Swithland Steam Gala. BR Class 26 D5310 Built by the Birmingham Carriage & Wagon Company in 1958. Withdrawn in 1992. Operational. Visiting the GCR for the 2013 Spring Diesel Gala. BR Class 20 20031 Built by Robert Stephenson and Hawthorns in 1960. Withdrawn in 1990. Operational. 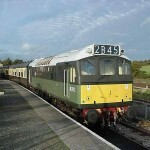 Visiting for the Diesel Gala on 7th and 8th September, 2013. 20031 left the GCR on 16th September, 2013. BR Class 25 D7612 Built at Derby in 1966. Withdrawn in 1987. Operational. 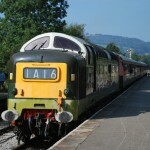 Visitng the GCR for the Diesel Gala on 18th and 19th May, 2013. Arrived on 15th May, 2013.D7612 left the GCR on 26th September, 2013. No.34070 "Manston" Southern Railway Battle of Britain Class 4-6-2 Built at Brighton in November, 1947. Withdrawn in August, 1964. 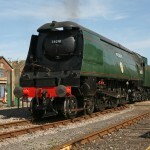 Restored to traffic at the Swanage Railway in 2008. Operational. Arrived at the GCR on 26th September, 2013 for the Autumn Steam Gala. 34070 left the GCR on 8th October, 2013. No.73129 British Rail Standard Class 5 4-6-0 (with Caprotti Valve gear) Built at Derby in August, 1956. Withdrawn on 2nd December, 1967. Visited GCR for the 2013 Autumn Steam Gala. No.5643 Great Western Railway 5600 Class 0-6-2T. Arrived on the GCR on 13th January, 2014 for the 2014 Winter Steam Gala. 5643 left the GCR on 5th February, 2014. Lambton Tank No.29 Built by Kitson and Co, Leeds in 1904. No.29, from the North Yorkshire Moors Railway, arrived on the GCR on 8th May, 2014 for the Swithland Steam Gala.No.29 left the GCR on 14th May, 2014. L92 (GWR No.5786) Built at Swindon in January, 1930. Withdrawn in April, 1958 and purchased by London Transport. Visiting the GCR for the Swithland Steam Gala. Arrived on the GCR on 7th May, 2014 and left on 4th June. Class 03 D2158 In recent times used by the Carriage & Wagon department at Rothley, D2158 left the GCR in July 2014. 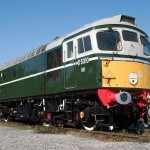 D9016 "Gordon Highlander" The Deltic will be visiting the GCR for the Diesel Gala to be run on 29th and 30th March, 2014. The locomotive arrived on the GCR on 20th March, 2014. Class 45 - 45041 "Royal Tank Regiment" Built at Crewe in 1962. Withdrawn in 1988. Arrived at the GCR in 2012. Entered GCR service in September, 2013 and left the railway in 2016.